Michael: First here's the A Dorian mode. Michael: I highlighted the root note of the B Dorian and then the entire pattern for the Phrygian, see how they share notes, or in other words they are RELATIVE, does this clarify the concept to you? 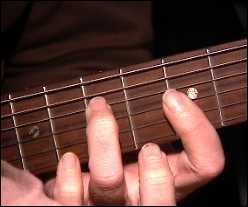 Michael: See how you cover a lot of neck using the scale pattern on the first string, and then moving up to the 12th fret position. This combination sounds very melodic. They really comes together when you play over the F on the jam track and then move into the higher pattern when the track moves to Am. I'll send you the F major and A minor arpeggios. Michael: This should help you visualize the patterns you can use, Lick 4 will use a A minor arpeggio rake. Michael: This lick basically uses the same pattern you used on lick 2, but this lime adding the A Minor pattern. 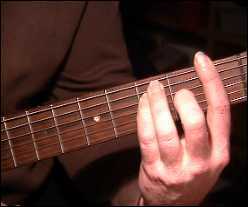 You can position your hand in a chord position and rake your pick downward on the strings. david: It's in the key of A? 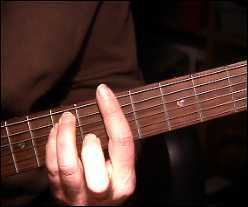 GeorgePrice: Where can I get more info on the Spanish Gypsy scale and its tonal structure? It seems to be a #4, b6, natural7. Michael: George, I'm going to do a series on exotic scales soon. jlancaster: Learned more in two nights than all year! jlancaster: (Don't really have any theory in me) just the scales. Been playing about 8 years. GeorgePrice: Teacher, any comments on what makes the Santana tone? Michael: Carlos tone is actually in his technique. I've seen him play Les Pauls, SGs and Paul Reed Smiths, he can make any of those guitars sound like HIM, if you know what I mean. I've also seen him use Mesa Boogie and Marshall amps before as well. Carlos is also a master at using the wah pedal. bluesman: George I have a line pod 6 and you can get the Santana sound real good out of it. Michael: I'm using a Brian Moore CP-90 with a Korg Pandora Box, they work great, very cool, well class time for me to go, see you next lesson!